Can you imagine how beautiful it might be to witness snow falling on the rust-colored surface of Mars or a steady rain of glittering diamonds on blue Neptune? No, these aren't images from Prince or David Bowie's lyric journals or scenes from some galactic version of "Game of Thrones." Rather, two studies published this week suggest what weather might be like on Mars, Neptune and Uranus. The Phoenix Mars Lander detected snowfall on the Red Planet in 2009 using a laser instrument to observe how the atmosphere and surface interact. But the other rovers and landers that we've sent to Mars haven't been equipped with this tool. Aymeric Spiga, a researcher at the Laboratoire de Météorologie Dynamique in Paris, wanted to take those observations from the Phoenix Lander and apply his expertise in numerical modeling of planetary atmospheres to reveal more about this weather we can't see. "I like to unveil the physics which underlie the behavior of clouds and weather in extraterrestrial planets," Spiga wrote in an email. "I feel like an extraterrestrial weather forecaster." Why, and how, did snow fall on Mars? And why wasn't there more evidence for it? During the Martian day, cloud particles absorb visible light to warm the atmosphere. But at night, in areas where the conditions are just right for water-ice clouds to form, it can lead to icy precipitation. Spiga's study was published in the journal Nature Geoscience. By combining computer models and the lander's observations, Spiga and his colleagues discovered that this nighttime phenomenon results in "microbursts" of snowstorms, some of which could last hours. "Those storms happen because water-ice particles within clouds are very efficient at emitting infrared light at night," Spiga said. "So clouds strongly cool the atmosphere nearby. This creates a very cold layer of air on top of a warmer layer of air. This causes convection and strong winds and mixing ensue." So why haven't the rovers captured images of snow piled on the Martian surface? In the instance of the Phoenix Lander's detection, the snow evaporated before it hit the ground. "Some snowstorms would be too high in the atmosphere for snowfall to reach the surface," Spiga wrote. "But one thing is for sure: The quantity of ice accumulating on the surface would be much less than on the Earth, and in some regions, this ice would sublimating immediately the next morning. So no snowmen or ski station on Mars!" Spiga likened this phenomenon to microbursts on Earth, often seen as clouds with little streaks on the bottom. This is called virga: rain that evaporates before reaching the ground. Going forward, Spiga and his colleagues want to explore the diversity of snowstorms that might happen on Mars and how they would impact the planet's water cycle. This could also help them take a look into Mars' past and the history of its water ice deposits, as well as look ahead by applying their models to exoplanets. "Since water-ice clouds on Mars create strong winds, our work can also be used to design future landing and flying systems in the atmosphere of Mars," Spiga said. Farther out in the solar system are Uranus and Neptune, two ice giants that get their distinct blue color from methane atmospheres. Although both planets are largely made up of fluids and gases, they have rocky cores. Weather-wise, high winds are associated with these ice giants, and Voyager 2 once tracked a storm on Neptune that was large enough to contain the entire Earth, according to NASA. Scientists have hypothesized that high-pressure conditions on Uranus and Neptune could squeeze hydrogen and carbon together, creating diamond rain. For the first time, an experiment was able to directly measure this diamond formation, according to a new study published in the journal Nature Astronomy. The researchers created shock waves in plastic with the Linac Coherent Light Source, the world's first X-ray free-electron laser at Stanford University's SLAC National Accelerator Laboratory. The team of 15 people spent five days underground in the confined space, fueled by little sleep and a lot of curiosity. The end result: Carbon atoms of the plastic formed small diamond structures called nanodiamonds when two shock waves overlapped. Nanodiamonds are normally produced by impact events, like explosions, and are just under a millionth of a meter in size. Lead study author Dominik Kraus was expecting to look for tiny hints in the data, not to see actual results. He is also a scientist at German research center Helmholtz-Zentrum Dresden-Rossendorf. His collaborators had warned that they might not observe any diamond formation at all. After all, experiments by other scientists hadn't been able to recreate this phenomenon in a lab. But just moments into the experiment, it was incredibly clear, Kraus said. "It was very surprising that we get such a clear diamond signature and that the diamonds form so quickly," Kraus wrote in an email. "Certainly one of the best moments in my scientific career." On Neptune and Uranus, these diamonds would be much larger: think millions of carats in weight. But what would diamond rain look like? "It will literally be solid, probably spherical raw diamonds that keep growing while falling downwards towards the cores of Neptune and Uranus," Kraus wrote. "However, the diamonds are not quickly falling in a gaseous atmosphere like rain on Earth but sinking in a very dense and hot liquid that makes up the gigantic 'ice' layers inside those planets." Unable to penetrate the rocky core, the diamonds would form a layer around it. Kraus believes this could help scientists understand a mysterious heat source on Neptune that is unexplained: The gravitational energy of the diamond precipitation, converting to heat as it sinks, could be the cause. This could also enable a greater understanding of planets' interiors. In the quest to find exoplanets, their type is often classified by the mass and radius relationship. For example, Earth is made of high-density material but has a small radius compared with low-density gas planets with a larger radius. The chemical reaction that causes diamond rain would influence that relationship because it releases hydrogen, inflating the planet's radius. This knowledge could help scientists determine where life outside our solar system may -- or may not -- exist. The fact that researchers have been able to create nanodiamonds from plastics in a lab, rather than by explosions, opens up the production possibilities. Nanodiamonds are used for medical imaging, for drug delivery and in electronics. "High-energy lasers may be able (to) provide a more elegant and controllable method (and) may provide an alternative to 'detonation nanodiamonds' that may be cleaner," Kraus said. "This is still to be demonstrated, but we are working on it." 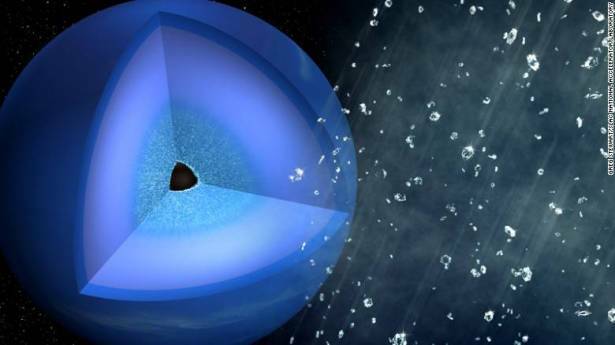 Given that NASA is considering potential missions to Uranus and Neptune, diamond rain may be on the observation wish list.